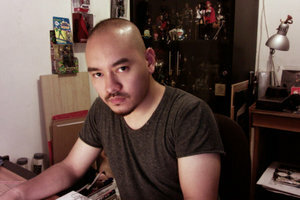 Born in 1984, Ario Anindito is a comic artist, illustrator, creative director and concept artist. He studied Architecture at Parahyangan Catholic University, in West Java, Indonesia. His clients list spans from Indonesia's huge companies such as PT. Djarum and Gudang Garam, to the biggest comic publishers in the world, Marvel and DC Comics. He has done several TVC concepts, novel illustrations, magazine covers, art directing for movies, designing statues + collectibles, and drawing comic pages. One of his notable TVC work, the L.A. Lights "Goat" version won the gold award at Citra Pariwara 2011. City : Bandung, West Java.